I think had I known I was approaching 100 posts on this blog, I might have done a better job of getting it done in a timely fashion! I seem to be on a roll this year -- taking 2-3 weeks between posts. Well, there's a LOT coming up so hopefully it will spur me to update more often. 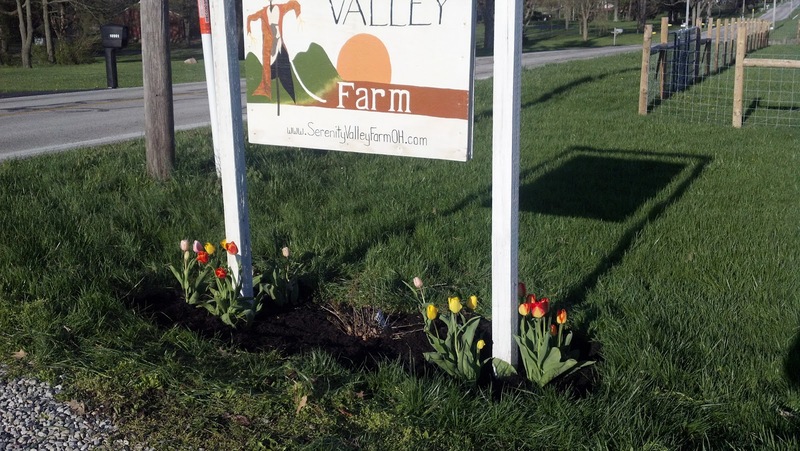 Regardless, welcome to Post 100 for the Serenity Valley Farm blog! Also... Welcome to April... before we end up hitting May! LOL So, what's going on? Plenty! The best news is also the most recent -- Shirley and Spider went to their first DLSC show with us this past weekend. It was the first hunter show of the season and held at Hilltop Equestrian Center in West Alexandria. This was my first time showing there. The arenas are a lovely size, but there's a bit of a bottleneck to get in/out of hte indoor where the show actually took place. Not to mention a few spooky elements in both rings, especially the indoor. I didn't get to see much of Spider's warm up or showing as I was working Shirley at the same time. Ella was showing her and from what I did see as well as the results (Baby Hunter, 1st on the flat, 2nd in both jumping classes and Reserve Champ for the division), I'd say they did fantastic! I entered Shirley in both warm up classes so she could have that extra time to settle (something Ella was also doing with Spider so I thought it was a good idea). The idea worked as our 2nd warmup was still anxious and nervous but not NEARLY as bad as the first. For classes, I entered her in the 18" division (Future Hunter). I cannot say enough about how proud of her I am. She was a bit looky when in the arena but she performed quite well given all of that. 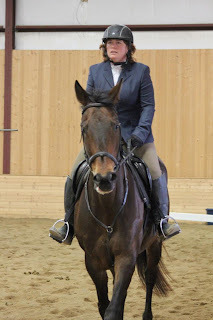 We did blow the 2nd canter lead in the flat class and did not place. Our jumping rounds were a bit faster than one would like to see for a hunter, and I opted to trot into the first fence instead of cantering. 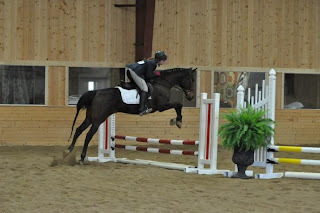 We placed 6th and 5th in the jumping classes. She stood at the trailer like a champ, even when her trailering buddy Gus was taken away. Really, she was quite amazing! Unfortunately, there aren't any pics of us jumping at this point. In other news, the cows are finally at freezer camp! Haven't heard when they'll be returning but it shouldn't be too much longer. I still have several things for sale and am contemplating setting up a yard sale maybe in July. However the one thing I don't have for sale any longer is the Ford Explorer. Traded it in and downsized to a 2004 Saturn Vue. Am really enjoying it! The garden as officially begun as I have several plants and seeds now IN the ground an some lovely flowers are popping up. Along the fence, though you can't see it, the peas have started to come up! 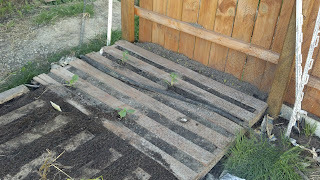 The 4 green plants are new broccoli transplants that I bought, and in the other pallet, I have a couple rows of spinach and lettuce. In addition, I'm attempting to grow spinach and lettuce in the gutter gardens on the fence again this year. One more shot. 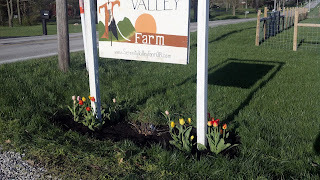 Love the multi-colored tulips that came up under the farm sign. Freshly mulched too! 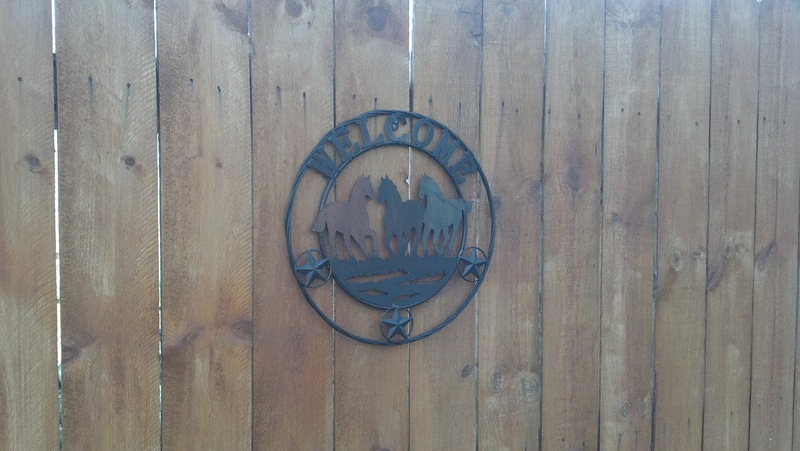 New sign on the privacy fence along the driveway. Seemed fitting, even if a tad western.